Despite advances in medicine, childbirth remains an area fraught with potential danger to mother and child, as documented in this month's issue of National Geographic. Reporter: It should be one of the most joyous moments in life, the birth of a new baby. But for far too many women in the United States, especially women of color and their families, it's not joy they're experiencing, but complications, and even death. When I checked, you know, they're like, okay, go back home, everything is fine. Reporter: Women like fantasia graham. And I knew deep down in my heart, everything was not fine. Because my body was just giving up. I was at my grandma's house. And, you know, getting ready for school. I just saw like blood. She was like, go to the hospital like now. When I got there, they did all tra sound and they told me that they didn't hear a heartbeat. The nurse pretty much told her, I'm sorry, your baby has passed away. I felt depressed. I felt sad. I felt hopeless. Reporter: Fantasia is one of several women whose experience is featured in this month's "National geographic" shining a light on the risks of giving birth in the United States. Who in particular is being affected the most? If you're an African-American mother, your risks of dying in childbirth are three to four times higher than if you're white. African-American women are less believed when they express that they have concerns about their symptoms, particularly around pain. Reporter: Despite our advances in medicine, childbirth remains an area fraught with potential danger to mother and baby. Even when you can have the best care in the world. She's perfect! 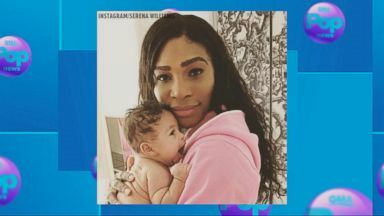 Reporter: For tennis pro Serena Williams, complications during childbirth almost proved fatal. Her experience highlighted in the HBO docuseries "Being Serena." I told the nurse, I can't breathe, I need a mask. And then my stitches broke. And -- it was just really hard. Reporter: Williams illuminating a stark reality, obstetric complications do not discriminate based on fame or fortune. A stark reality all too well. A first-time father to 4-month-old musin. He beams with pride as he shows off the nursery he and his partner designed. Everything was tynesha's idea. The name on the wall, his crib, everything. Reporter: Now all of this just reminders of the life they could have shared. He's going to miss out on having a great mother. That's what hurts so bad about this situation. Reporter: His partner, 36-year-old tynesha, died during labor. A caring, loving person. Reporter: Her pregnancy was going well. She was not high risk and had been regularly going to prenatal visits. During labor she began having trouble breathing. She went into cardiac arrest. Doctors performed a bedside emergency c-section to try to save her and the baby. But for tynesha, it was too late. She came out and told me, I'm sorry, she didn't make it. I broke down. I witnessed her take her last breath in front of me. Reporter: She died of an amniotic fluid embolism, an often fatal complication that occurs in 1 out of every 10,000 pregnancies. We don't know why it happens or how to prevent it. Among developed countries the United States has the highest rate of maternal death. Every year there are an estimated 60,000 serious obstetric complications and approximately 700 deaths, either during or soon after pregnancy. An estimated 60% of those deaths are considered preventible. United States of America, 2018, 75% of the nation's land mass, you might not have access to anybody qualified to deliver your baby. Maternal mortality in this country has been going up for 20 years. We haven't had the kind of response that you'd expect for something that significant. Reporter: So obstetricians like Dr. Shaw have made it their mission to find solutions to the cracks in the foundation of care inside the hospital so they can be applied on a national level. Last spring we spent over 24 hours with him and his team in labor and delivery at Beth Israel medical center to see how they do things differently. It starts with communication. A moment like this, called the huddle. She's currently 5 to 6, 80, and minus 2 -- Reporter: All the doctors and nurses meet to discuss every patient on the labor floor so everyone is accountable for everyone's care. It's been shown across the country, to make a really big difference in patient safety. Allergies to medication? Reporter: Down the hall, Wendy and husband John have just arrived. In labor with her first baby, Wendy has decided to try to go without an epidural. Deep breaths, deep breaths. Reporter: Something only 10% of women choose. And she's given the time to explore this option. Time, another tenet of Dr. Shah's approach to fixing the system. Keep doing what you're doing, deep breaths. Reporter: It's about knowing when to wait and when to act swiftly. I think my water just broke. Oh, good. Reporter: Eventually her contractions become more painful. It's not a cop-out to get an epidural. If that's what you want to do, we're 100% behind you in supporting you to do that. Okay, epidural. She gave the order. Reporter: Four hours later -- Big push. There she goes! More, more, more, more, that's it, that's it, that's it, hi, little one! Oh my gosh. Reporter: But in that moment of joy -- Would you like to cut the cord? Reporter: Wendy is unaware she has started to lose a lot of blood. You have a higher than average amount of bleeding right now. We have a resident? Reporter: For Dr. Shah, now is the time to act swiftly. There's two places where you can have a little bit of extra bleeding. One is from the tear, one is from the uterus. We gave you medicine to help the uterus, we're going to repair the tear now. Reporter: She's lost a liter in blood as a minutes, which qualifies as a postpartum hemmorage. There's something pumping that I think is probably vaginal. I think we're okay. Thank you so much. One big family. Fist bumps all around. Thank you very much, thank you. Reporter: While Dr. Shah is working on hospital protocol, Briana green is working at the community level to help the most at-risk demographic, African-American women, to have better outcomes in childbirth. I'm a peri natal community health working. Reporter: Briana, mother of two, decided to take action after having a c-section when she had hoped for a natural delivery. Not even a year later I happened to hear about mama soso village and I said, I want that type of training. We provide comprehensive support for women prenatally through postpartum. So what about the baby? Baby's looking good? This is the most active child I have ever had. With clinical issues, so physical health issues, they're also presenting with social issues. Which puts them at a higher risk for mortality. Reporter: Briana recognizes that the odds are stacked against women of color in general when dealing with maternal mortality. The statistics don't lie. We can look at different factors. Poverty, homelessness, food insecurity, things of that nature. But upper middle class black women have the same outcomes as black women who are in poverty. A mom will say, I'm concerned about this issue, and their concerns are dismissed or diminished. Reporter: But today with Briana as her midwife to make sure all her needs are met, fantasia welcomes a new baby. He's beautiful. It's worth me going out every day and trying to make a difference with even one mom. Or in my case, 50 some odd moms a year. Reporter: Skilled midwives, better hospital protocols, all pieces of the puzzle being put together by health care professionals across the country who are dedicated to the women delivering these miracles every day. What keeps you up at night when you think about the maternal mortality crisis? It's entirely preventible. You look century of health care in the United States. We've had tragedies and we've had triumphs. But I think that this is a situation where we can right the ship and do a lot better. Reporter: For "Nightline," I'm Dr. Jennifer Ashton. "National geographic" special edition single-topic issue "Future of medicine" is online and on newsstands now. 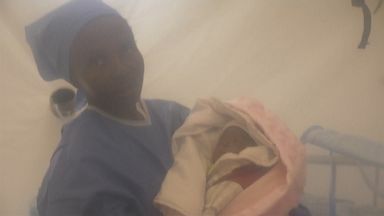 The baby's mother, who had Ebola, died in childbirth. 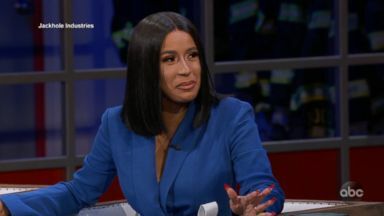 Rapper and new mom Cardi B told Jimmy Kimmel she's loving motherhood so far, but she's still in shock.